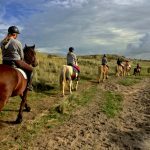 We offer the possibility to make a trail ride with us all year round, at a beginning, intermediate or advanced level. We follow beautiful routes across the beach, through the dunes and through the forest. 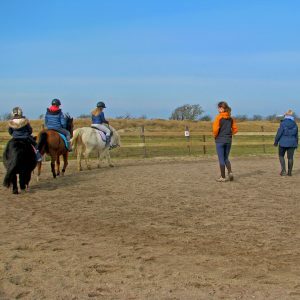 The trail rides take place in small groups under supervision. Because of our small scale it is advisable to book in advance. Feel free to contact us for more information. Please contact us outside the opening hours via the contact form, text or Whatsapp. You will normally receive a response within 24 hours. For trail rides we have a weight limit of 90 kg. (about 200 pounds). 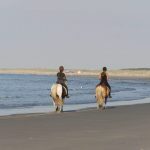 We provide riding lessons for both children and adults. 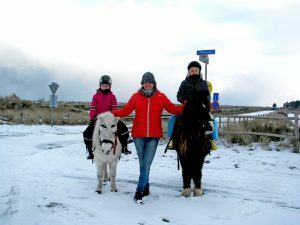 During the holidays, riding lessons are given daily for children from 6 years. 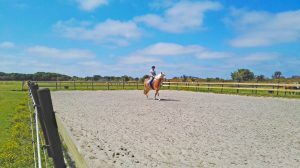 There are separate lessons for beginners and advanced riders. 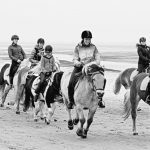 In beginners’ lessons children learn the principles of horse riding in a playful way, such as steering, riding figures and trotting small distances. 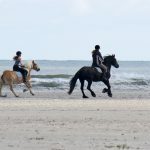 In the advanced lessons, galloping is also practiced and more attention is paid to the position of the rider on the horse. Here we find it important in the first place that children have fun. Lessons are given in groups of up to eight children. You also have the option to let your child take private lessons. 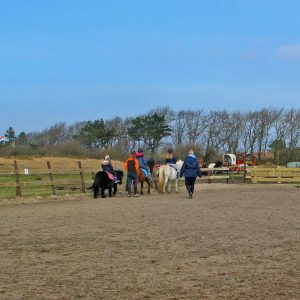 For adults we also provide private riding lessons or lessons in small groups. We adapt these lessons to your level and your wishes. For example, think of mastering the principles of riding, overcoming fear or taking an extra step towards dressage. You can also book a lesson outside the opening hours. Please contact us in time if you would like to do that. 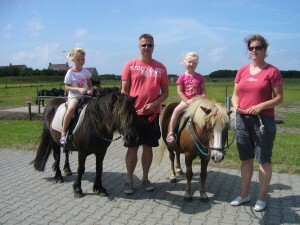 For children of all ages you can rent a pony at our stable. This way you can make beautiful trips to the beach, through the dunes or through the forest. Usually you do not have to reserve. Would you like to rent several ponies? Then it is useful to contact us in advance. 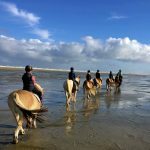 Would you like to take your horse with you on your holiday? 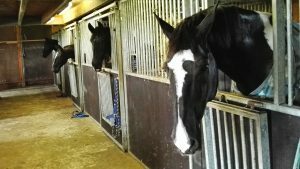 We offer stabling and grazing, on both part livery and full livery. 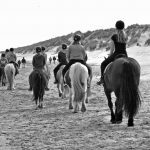 Our stable is ideally located on the equestrian route to the beach. You can also use our outdoor riding arena. 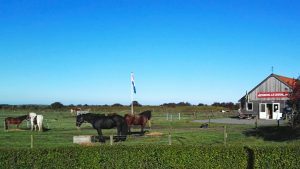 Horses that are staying with us have their own piece of land at their disposal. You also have the possibility to rent a box. 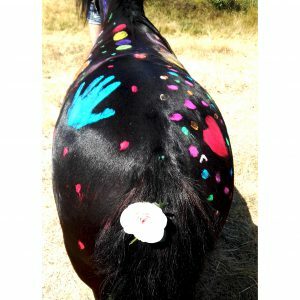 We attach great value to the health of our horses. Because of that our horses have been inoculated and dewormed. We also demand this from our pension horses. 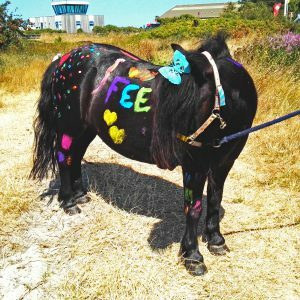 In the summer holidays (see the opening hours for dates) we organize fun pony afternoons on Tuesdays for children from 6 years old, where children spend an afternoon with the ponies in a playful way. 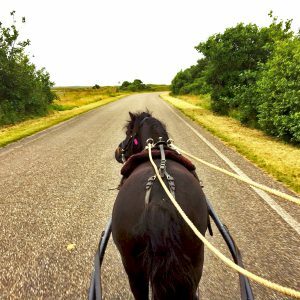 There are a lot of fun activities, such as a covered wagon ride, ‘pimp my pony’, riding lessons, a horseshoe pitching game etc. Often we have a theme such as pirates, Indians or cowboy’s.